Have you ever thought: "what would I bring if stuck on a deserted, desert island?" Being extremely practical, my answer would be loads of freshwater and some form of shade. Or, in earlier years, I might have made a top-10 list of "must-have" books, or music, or something utterly useless on a desert island. Luckily, I have never been stuck in such a situation, but today I did get to visit Abulat. To celebrate a perfect day with glassy calm seas, beautiful corals, and LOTS of scientific productivity, we ate lunch while anchored by an uninhabited desert island (scorching hot!!!). The island of Abulat is a raised coral island, part of the Farasan Banks off the coast of Al Lith, where we're been working for the past few days. Intriguingly, it has an emerged coral knoll, which basically means that there are old (probably fossil) corals exposed above land. If you look at the below photo, you'll see two pillars in the center. If you look closely, you might notice the radial polyps characteristic of Acropora corals. These emerged coral knolls contain lots of information about what used to live in the sea. I'm not a paleobiologist or a geologist, so unfortunately I have no idea how old these islands are, but you can see an exposed bivalve shell and many other mollusks and corals exposed in the rock that are still living on Red Sea reefs today. These sorts of exposed coral outcrops are commonly used by paleobiologists and geologists to understand how reefs used to look, and to understand how past disturbances have impacted reefs. Because corals and other reef organisms are made of calcium carbonate, they leave their stories behind in the rock. In special places like Abulat, those stories are exposed for all to see (no digging required). Abulat Island, a raised coral island on Farsan Bank, Saudi Arabia. 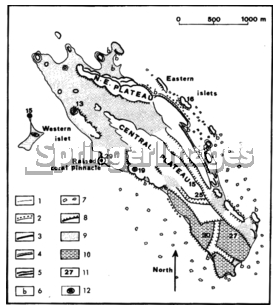 1 – low coast, 2 – coast with fallen blocks, 3 – overhanging scarp, 4 – double overhang, 5 – successive overhangs, 6 – beach rock, 7 – living coral heads, 8 – fault scarp, 9 – low plain, 10 – karstic plateau, 11 – heights in metres, 12 – emerged coral knoll. Now, if you look closely, you'll see that there are three different schools of fish interacting with each other, all being threatened by larger fishes below (jacks and snappers). The sandy bottom makes it easy to see all 3 fish schools.